Why Soccer Referees Need to Train by James M. Wilson, Jr.
1) General and specific fitness demands of the entire referee crew. 2) How to better test and develop fitness needed for match readiness. 3) How to train speed and change of direction and the role of plyometrics. 4) Why referees need to strength train and the role of heavy weight training. 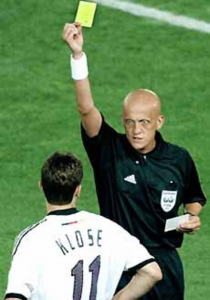 The referee crew is comprised of 3 positions – the head referee (referee) and 2 assistant referees (assistants) (we will ignore the role of the 4th official). While both positions have unique responsibilities, they both are at distinct physical disadvantages when compared to players. At the elite level, referees tend to be 15-20 years older than players, in which players are maturing in their physical development and improving their capacity to perform while referees are fully physically mature and need to stave off decrements in performance. For example, elite referees have a slightly lower maximal aerobic capacity or maximum rate of oxygen usage (VO2Max) when compared players, despite the potential for greater training experience and adaptation. Referees at the elite and non-elite levels are often non-professional and have other careers that detract from the time and energy towards training and developing other skills required for refereeing; whereas players are often practicing and competing multiple times per week. Unlike players, referees cannot be substituted for; therefore they must truly be fit and ready for the demands of an entire match, which can exceed 90 minutes (1). In addition to the physical demands, referees can experience the intense psychological pressure of balancing game flow versus “getting the call right,” ensuring player-safety and managing outside factors, such as coaches, substitutes, and fans. These factors can bring about increased stress and fatigue on the members of referee crew. While both positions require competent perception of gameplay and cognitive processing of the rules, along with high levels of aerobic fitness with intermittent bouts of high-intensity runs, each position is unique in the physical demands. The head referee (referee) is the most important individual of the referee crew, and, therefore, subject to the most physical and psychological stress. The referee’s responsibilities mainly consist of field player management, calling fouls, issuing disciplinary actions – cautions and ejections (yellow and red cards, respectively) – towards players, substitutes, and coaches, and crowd and time management. The game requires referees to walk, jog, run, accelerate, sprint, and move in all planes of motion in order to stay within eyesight of the play with the optimal angle of viewing the ball, involved players (attackers and defenders, the goal (if necessary), and the lead assistant referee (typically to right of the referee) in order to best make decisions. 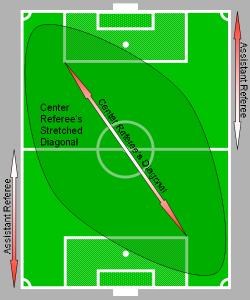 Figure 2 shows the general movements of the entire referee crew. The physical demands of referees during elite-level matches are well-researched and consistently show that referees must be as aerobically fit, if not more than, the players. Elite-level referees can run between 9-13 kilometers attaining between 85-90% maximal heart rate and 70-80% VO2Max, with high-intensity runs being 4-18% of the total distance. This makes the performance profile of referees most similar to that of midfielders (1). Therefore, specific training for the role of the head referee is needed to develop aerobic fitness and repeat sprint ability. A special consideration should be given toward elite and, possibly, sub-elite female head referees based a recent study that found elite female referees had less aerobic fitness and poorer performance, when compared to their male counterparts. Female referees possessed a VO2Max that was 7% less and a treadmill performance that was 11% less than the males. Only 2.5% of females had VO2Max values higher than the average male referee’s value. 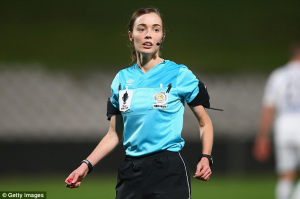 Due to most players having a VO2Max superior to that of male referees, it is pertinent that female referees train appropriately and specifically to their needs. The conclusion and recommendation were that elite-level female referees should train at intensities at or above their anaerobic speed threshold (95% of their maximum heart rate) as well as include speed, power, and strength training to make up the difference in aerobic performance and keep up with the players during matches (2). As an assistant referee (assistant), it is also crucial to be aerobically fit and perform bouts of high-intensity runs and sprints in order to stay in line with the second to last defender (offside line). The type of running performed is quite different from that of the head referee as there is a greater emphasis on lateral movement and sideways running, which allows for a superior view of the offside line. 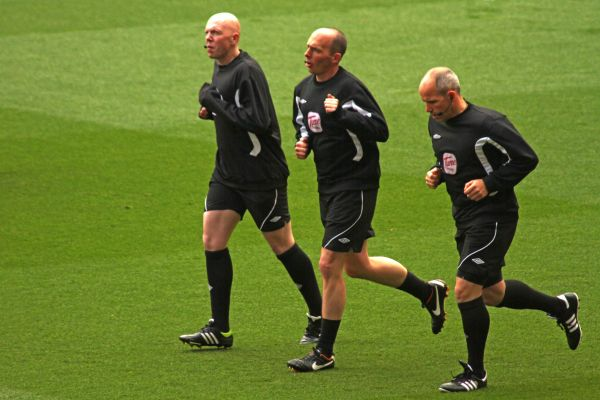 A study of elite-level assistant referees showed that they ran an average of 7.28 km (over 4.5 miles), of which 1.15 km was high-intensity running and 1.16 km was sideways running (3). The same study showed that assistants in the second half were worse at keeping up with the offside line largely due to decrements in sprint performance. Therefore, specific training for the role of assistant referees is needed to develop repeat sprint ability and change of direction, especially into/out of the frontal plane (sideways movements). “Each year the players stay the same age and get better, while I keep getting older.” This pertinent quote from another referee is one I always keep in mind. It reminds me that I need to continue to improve my skills and fitness because the players I officiate will always be X-age, and they are always practicing and competing to be at the top of their game. While most referees know this to be true, I, along with the players, coaches, and fans, are not seeing many referees across various sub-elite levels taking their role and fitness seriously. As the game of soccer grows in popularity locally, regionally, and globally, players are often receiving improved training from their coaches and clubs, so it is increasingly crucial for all members of the referee crew to do the same. How exactly referees and assistants should train will be discussed in further blogs, with future blogs on how the Federation Internationale de Football Association (FIFA), the Union of European Football Associations (UEFA) and other referee organizations can better test and develop the main requisite physical demands – aerobic fitness, repeat sprint ability, and change of direction.